While [Vinod] says he’s not an expert in this sort of thing, we really like his audio spectrum analyzer build from a simple microcontroller and LCD display. It is a well-studied fact that every audio waveform – a recording of your voice, for instance – is just the sum of many, many sine waves. These sine waves can be plucked out using Fourier analysis, using a Discrete Fourier transform. 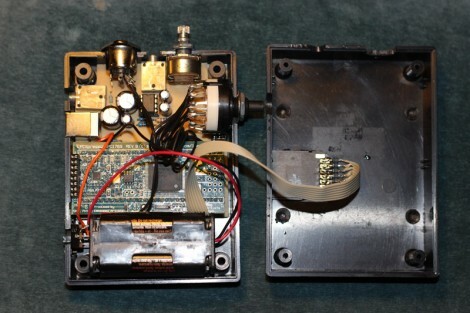 This is the principle that spectrum analyzers operate under; [Vinod] wrote a bit of code using DFT to take apart audio captured from a microphone and output their frequency on an LCD display. To output the spectrum on his LCD, [Vinod] stacked horizontal bars up into 8 custom characters in his display. Like [Vinod]’s previous audio on an ATMega32 experiment, an LM324 amplifier is connected to the ATMega through an analog pin. [Vinod] has a very clever build on his hands with his spectrum analyzer, and a great answer to the perennial ‘how do I build a guitar tuner’ questions we’re constantly asked. After the break, you can see [Vinod]’s spectrum analyzer in action. Be forewarned; you may want to turn down the volume. The guys at Inventables put together a neat CNC router kit that looks very interesting. It uses Makerslide linear bearings and CNC’d parts to make a surprisingly cheap frame for something that can engrave wood and metal. Inventables is running a Kickstarter-esque preorder to fund this production run but right now they’re 30 orders short. We’d like to see how these routers turn out in the real world, so if you’re on the fence (or just want a CNC router), this might be the time to buy. [Jared] sent in a fume extractor he put together. It’s a small PC case fan with a carbon filter sandwiched between a pair of grilles. Not much, but if should keep those wonderful flux fumes away from your face. [filespace] shared an awesome Electrofishing video with us. Electrofishing pulses a DC current through two electrodes attached to a boat. This current causes galvanotaxis in fish, causing them to swim towards the anode. The fish can be caught with a net and released afterwards; there’s no damage to the fish at all. We’d love to see a DIY solution, but throwing M-80s into a lake doesn’t count. [Raivis] lives in the country, so even his voice reception on GSM is terrible, let alone data. Inspired by an earlier post, [Raivis] built a discone antenna to improve his cell signal. Now everything is crystal clear and his Huawei E1752 USB/GSM modem improved from 3 mbps down to 5 mbps down. [Dana] sent in a few pics of a project he’s working on. He’s making halftone prints with a CNC and metal. We’ve seen this before, but we’re really loving [Dana]’s take on it. He’s using two-layer engraving plastic with a .005” engraving tool on his CNC. There’s a gallery of his work after the break; [Dana]’s portrait is 14000+ dots and took 6 hours, his bosses kids are 16000+ dots and took 4 hours, and [Dana]’s niece is 5500 dots and took 35 minutes. Very awesome work, and now [Dana] has fulfilled a lifelong dream of machining his face. The problem of gripping all surfaces has always plagued the field of climbing robotics. But if you don’t care about damaging the wall, why not just let the robot glue its feet to the surface. That’s exactly how this robot does it, using a couple of climbing feet in conjunction with a hot melt glue gun wielding arm. 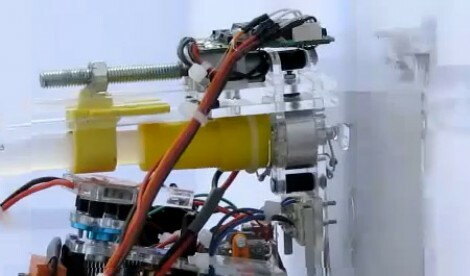 It seems to be a predecessor of the hot glue 3D printing robot which we saw last week. Check out the video to get a full overview of the climbing process, but here’s the gist of it. The legs and arm are able to pivot around the central axis of the robot, parallel to the climbing surface. Once one leg is glued in place the robot swivels around it so that the body is directly above that leg. From there it reaches up with the arm to deposit some glue on the wall, then moves it out of the way so the other foot can be pressed against the hot adhesive. When the newly attached foot has cooled sufficiently, the lower foot is reheated to free it from the wall. At this point the whole process repeats. We’re still fond of vacuum-based climbers like this parachute-equipped robot. But the design of the hot-glue arm on this guy is something that might make it into one of our own projects someday. This portable sample player packs quite a punch. [Lee] wanted a nice portable way to take his samples with him, but refused to water-down the features just because it is portable. He set of goal of playing between 3-8 simultaneous notes from a large assortment of stored samples. Sample space was the first design consideration, and it’s hard to beat the price per megabyte of an SD card. After some calculations he concluded that it is possible to pull these samples off the card quickly enough to achieve his simultaneous note goal at CD quality frequencies, but only if there is little or no latency when reading from the card. This means [Lee] needed a fast processor so he chose the LPC1769 which is an ARM Cortex-M3 processor which can run at 120 MHz. The project box includes room for a volume knob to control the output from the in-build headphone amplifier. There’s also a rotary encoder for selecting sample sets. But we’re a bit confused on this part as the device is MIDI controlled. [Lee] is the creator of the electronic Moolodeon, which itself has MIDI out and will be used as a controller for this project.